Her story, "After 14 years of being diagnosed with gastroparesis, a nurse practitioner told me this morning, that I don't have gastroparesis because I am not thin enough and don't vomit." 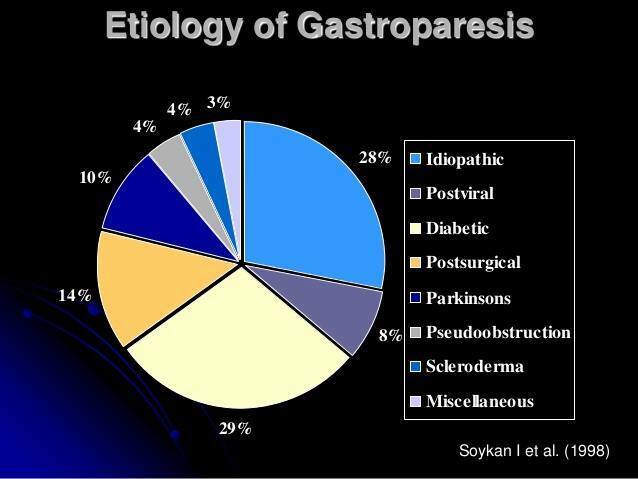 There are many kinds of Gastroparesis, many faces of Gastroparesis, and because everyone is different, it is hard to diagnose and treat. 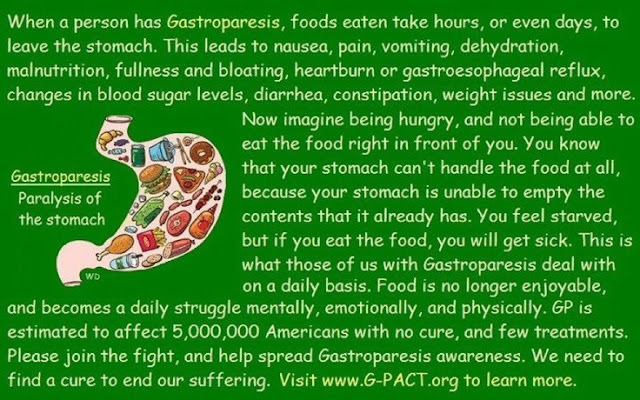 I, myself, have had Gastroparesis since about 2000 after an appendix surgery but was officially diagnosed in 2012. I do vomit, but that doesn't make my Gastroparesis more than someone who does not vomit, or my Gastroparesis less than someone who may have a feeding tube. There are also people who gain weight with Gastroparesis. 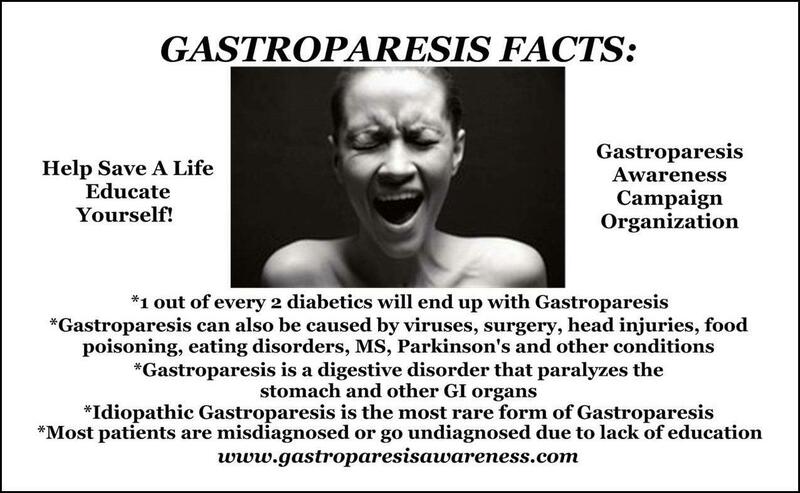 However, Gastroparesis is Gastroparesis. It does not matter how much you weigh, because that does not mean that you are not malnourished or that you are not vitamin deficient. The Vagus Nerve is still damaged. 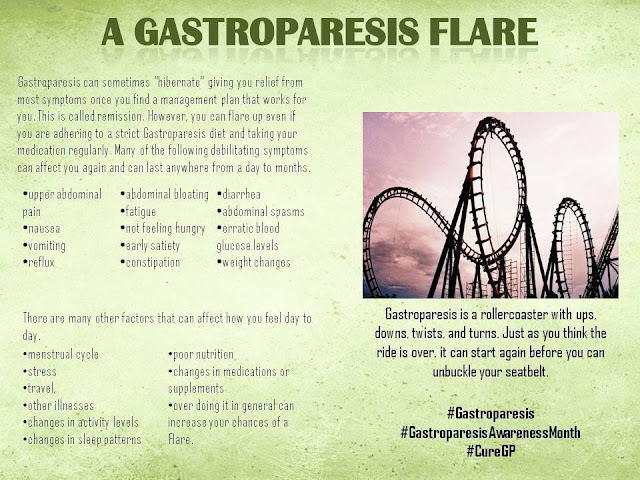 First of all, let's go into what Gastroparesis actually is and what causes it before we go into the different types of Gastroparesis. 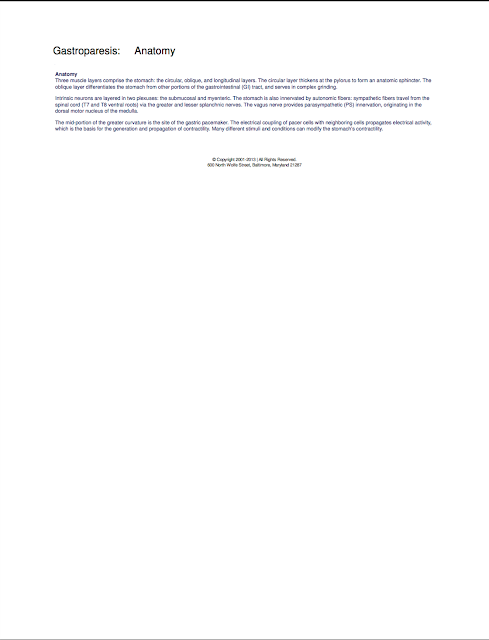 "Most people live in fear of some terrible event changing their lives, the death of a loved one or a serious illness. For the chronically ill, this terrible event has already happened, and we have been let in on an amazing secret: You survive. You adapt, and your life changes, but in the end you go on, with whatever compromises you have been forced to make, whatever losses you have been forced to endure. You learn to balance your fears with the simple truth that you must go on living." Sources from GPACT and Imgur from years ago for the above images. Source from Imgur years ago. 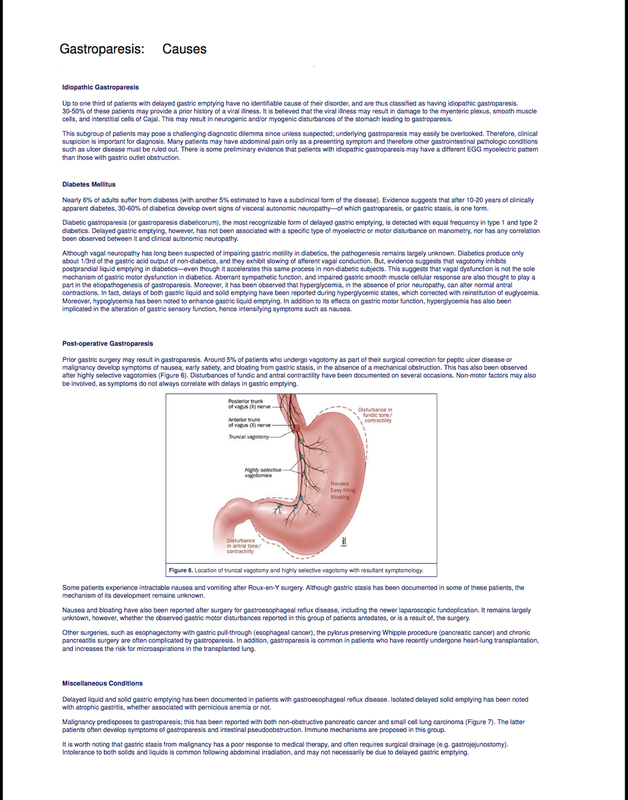 The symptoms associated with gastroparesis range in severity, but can be very debilitating. Common symptoms include: nausea, vomiting, bloating, early satiety, postprandial fullness, and abdominal pain. In extreme cases, the inability to digest foods and liquids properly can also lead to malnutrition, weight loss, and dehydration. 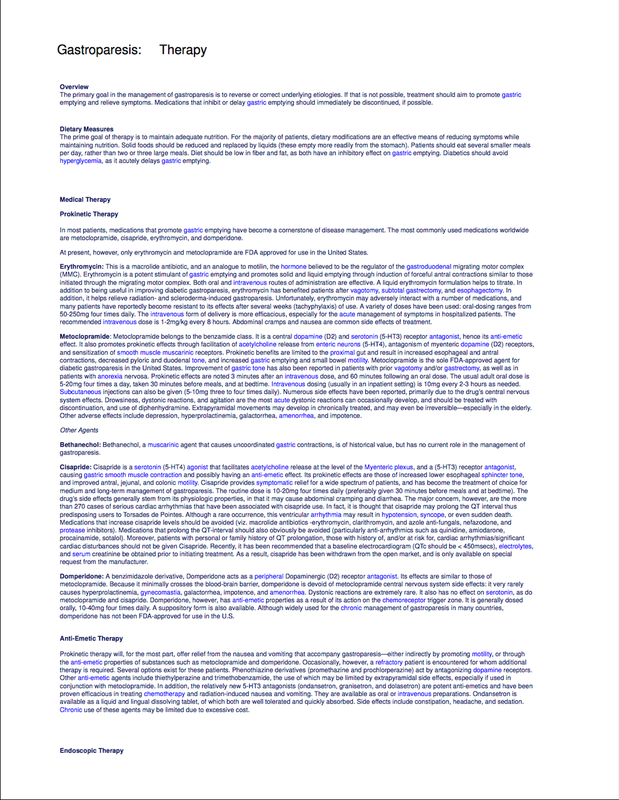 Source included in the image. These symptoms can mimic a number of other health conditions (e.g., functional dyspepsia), and a medical history, physical examination and testing will help to discern if gastroparesis is the most likely explanation for the patient’s symptoms. 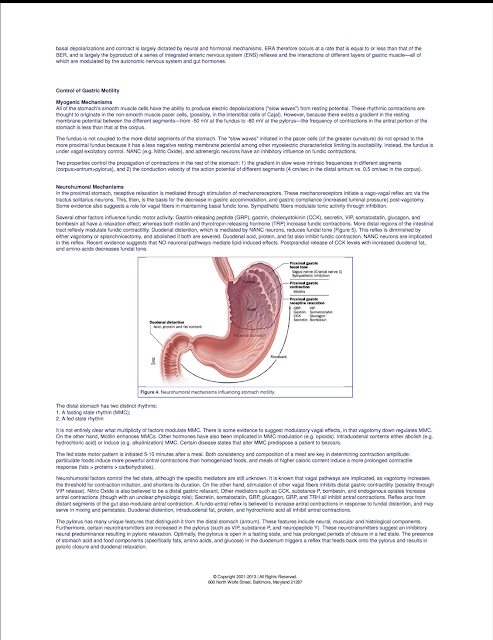 Imaging tests and physiological measurements are used to determine the functioning of the stomach and the rate of gastric emptying. Some patients have severely delayed emptying but little in the way of symptoms, whereas other patients may have severe symptoms with only minor delays in emptying. In other words the severity of symptoms and the rate of emptying may not be closely correlated, which is why the abnormalities of sensation (which cannot be as easily measured) are likely to be important. 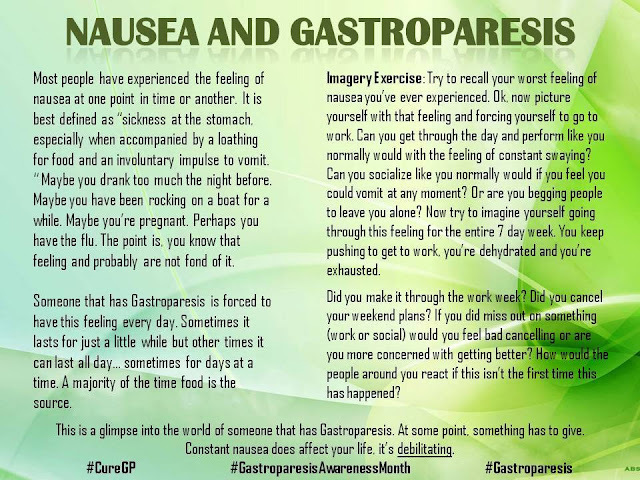 Nausea: One of the main symptoms of gastroparesis is a feeling of nausea that may be accompanied by vomiting. Whilst dietary modification and prescribed medications can be helpful in addressing this symptom, there are also some other approaches that can lessen nausea. Using ginger to make a tea, as an ingredient in recipes, or taking ginger capsules, is known to ease nausea and speed up gastric emptying in some people. 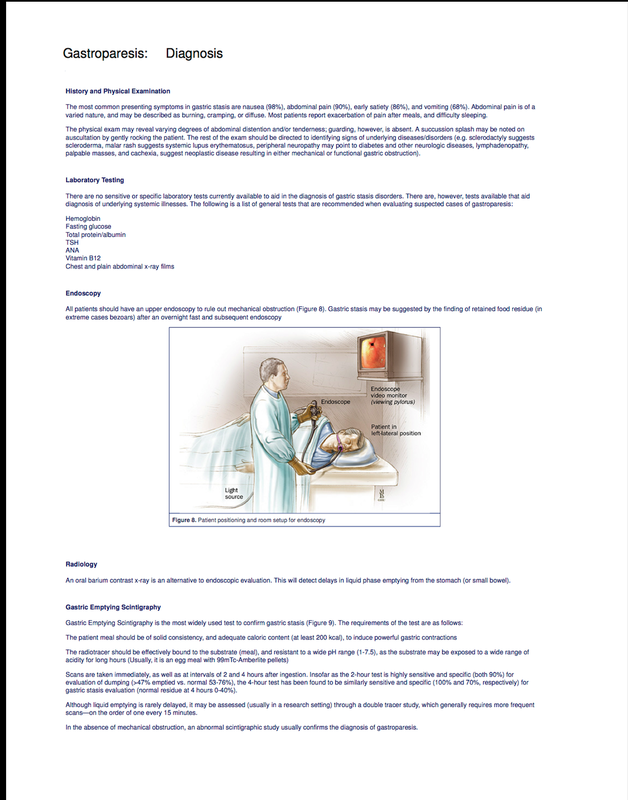 There is also evidence that stimulation of acupoints PC-6 and ST-36 can help relieve nausea and improve gastric emptying. 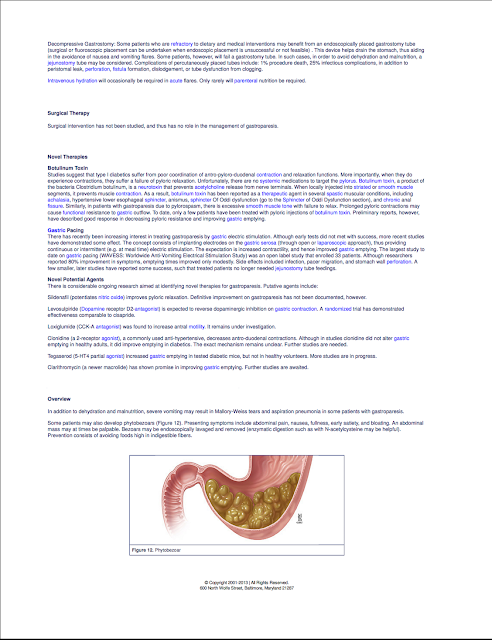 Abdominal pain: Many people with gastroparesis experience abdominal pain and discomfort. 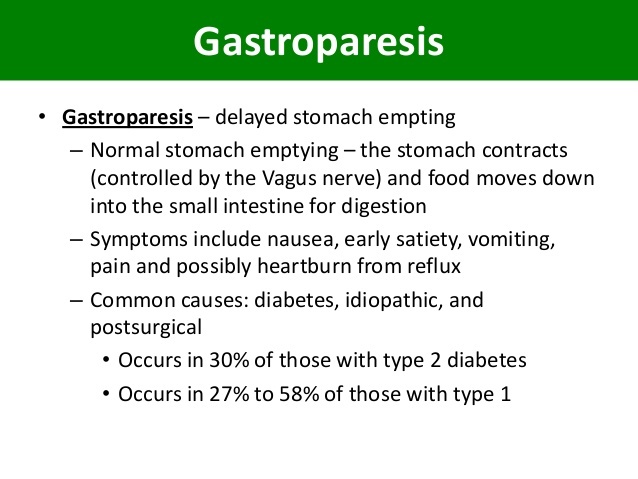 Gastroparesis generally does not cause sharp stabbing pains, but instead pain that is vague and crampy in nature. It is commonly made worse by eating, and may disrupt sleep at night. Pain relief in the form of applying a hot pack to the abdomen for short periods may be helpful. The frequency and severity of pain episodes may also be reduced by treating gastroparesis with dietary modification, as well as natural, over the counter, and prescribed medications. 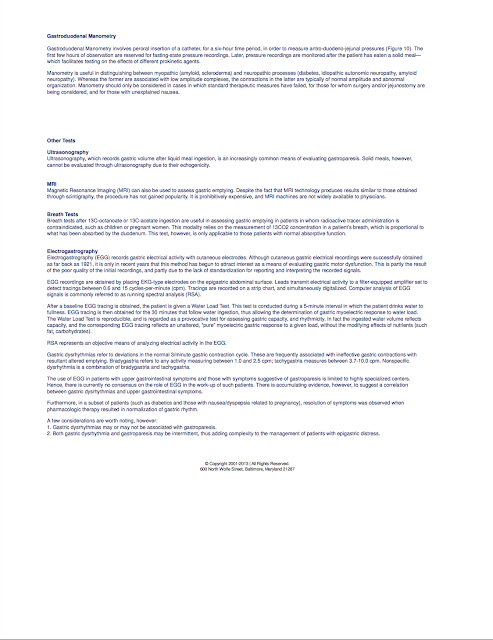 Opiate based medications (eg morphine) are best avoided as they can lead to an increase in symptoms in the long term and are highly addictive. Pain in gastroparesis can have a significant impact on quality of life. 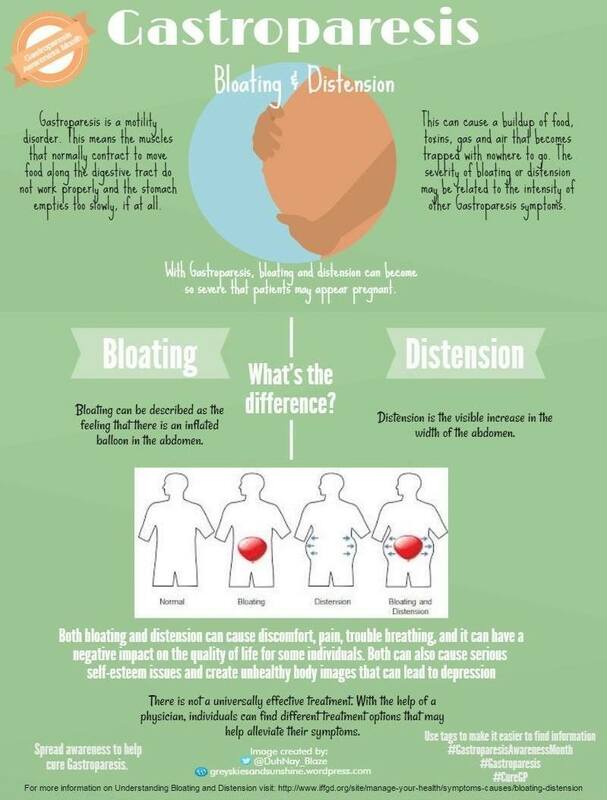 Learning techniques to cope with the symptoms is an effective strategy to make living with gastroparesis easier. 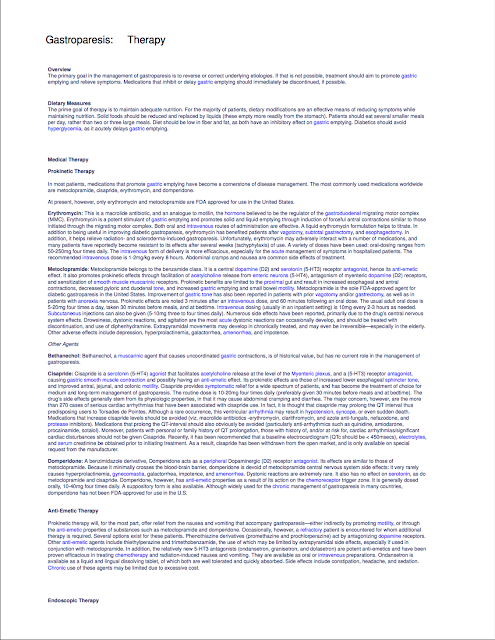 Techniques that can be helpful in managing pain include those used by psychologists, for example cognitive behavioural therapy. 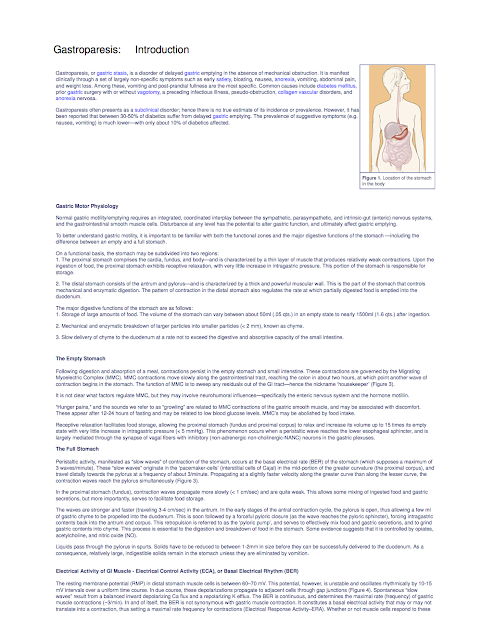 Depression and anxiety: It is common for gastroparesis sufferers to experience anxiety or depression. This may be due to the symptoms themselves, or to other issues such as family, relationships, financial stresses, or even to significant life changing events from the past. 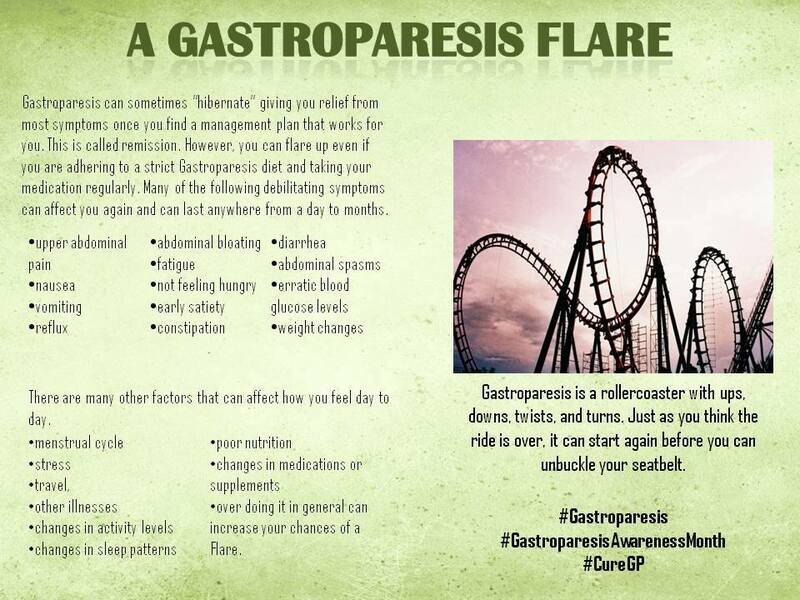 The symptoms of gastroparesis may interfere with the normal activities of day-to-day life. This can lead to tiredness, low mood, low energy levels, and feelings of being out of control, tense, or anxious. This in itself will make the experience of living with gastroparesis more difficult and can create a vicious cycle of increasing symptoms leading to more anxiety and a further increase in symptoms, impacting on the overall condition of the person’s health and quality of life. 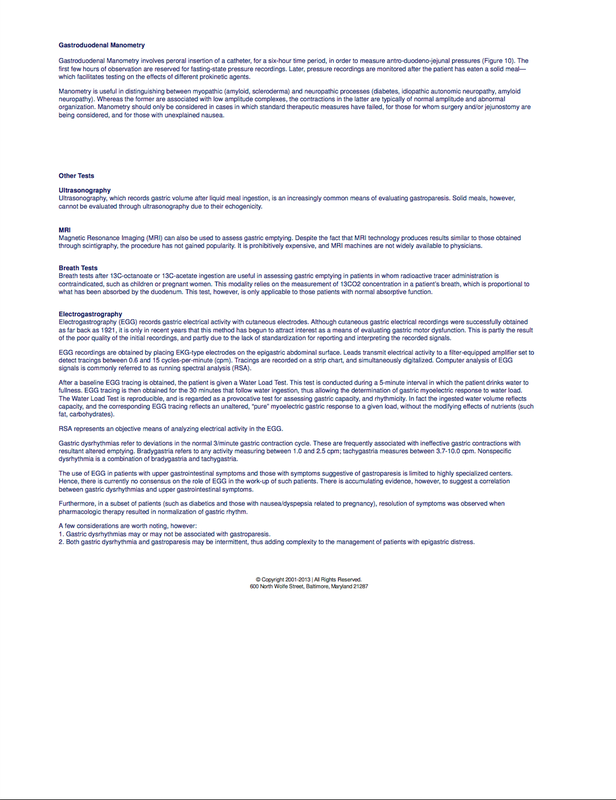 If any of the above feelings or events is pertinent to your care, then this should be discussed with your doctor, and if there are previously unresolved psychological issues then it would be the right time to address these as part of the treatment plan. Treating these issues can improve the ability of the mind and body to cope with gastroparesis. If your doctor feels that depression and/or anxiety is contributing to your symptoms, your doctor may suggest medication. It can often take some time to work out the right medication and dosage before it has a favourable outcome. Alternatively, a referral to a psychologist for further assessment and treatment may be appropriate." Source: A friend made these images. 2. Everyone is different (and that is why it is so hard to treat and find a cure). 3. Not everyone has the same symptoms (for instance, I vomit but my friend Kenny does not). 4. 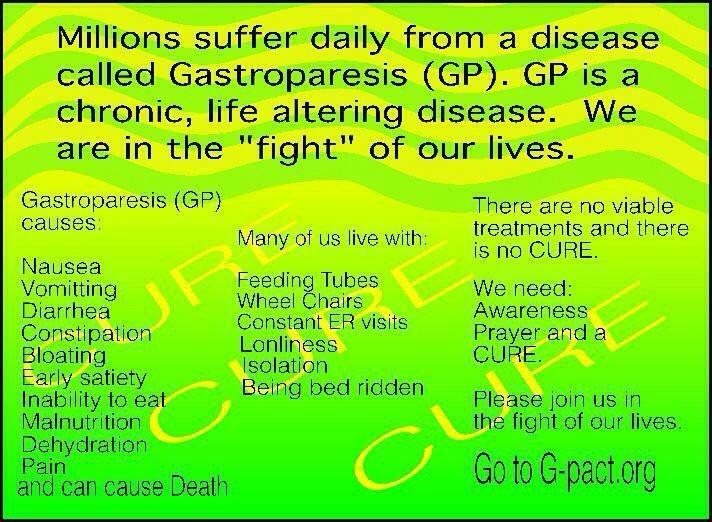 Not everyone with Gastroparesis is on a feeding tube. 5. Gastroparesis can range from mild to severe. 6. Just because people have a "mild" form of Gastroparesis, that does NOT make their Gastroparesis any less than someone who vomits or has a feeding tube with it. 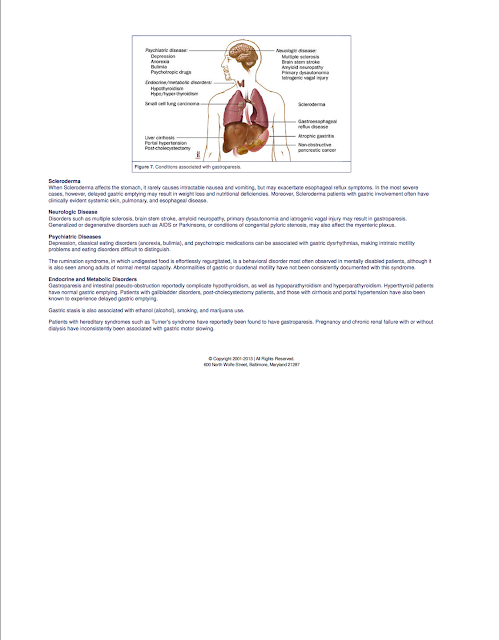 Vagus nerve damage is vagus nerve damage. In conclusion, Gastroparesis can effect each person who has it differently. 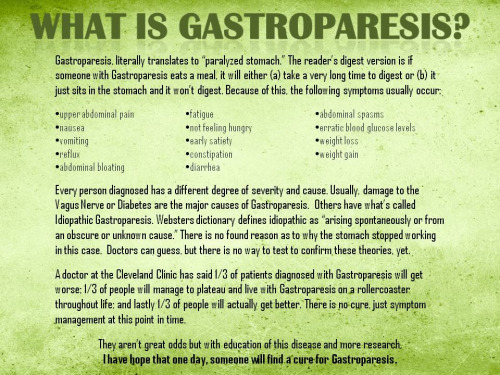 It does not mean that the person is less sick if they have a milder form of Gastroparesis. In the end, it is a motility issue that will be with that person for the rest of their life. It is not fair to compare someone on a feeding tube with Gastroparesis to someone who vomits daily with Gastroparesis. That serves no purpose because those people are both very sick with a motility disorder and they deserve respect and understanding.